I have been watching a few utube videos on milk steaming. Looks like you have that bit down pretty well. My first recent attempt gave a blob... So yours is impressive! 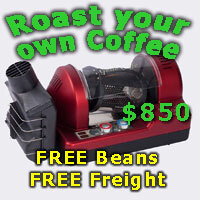 I opened up our coffee shop today, grabbed some expired beans and started steaming. After 15 shots and about 2L of milk, I didn't come anywhere near that. Pretty good for a first attempt!! Have a google for verve coffee latte art, great vid that I found simple yet effective, and easy to comprehend. Cheers artman I will check it out .